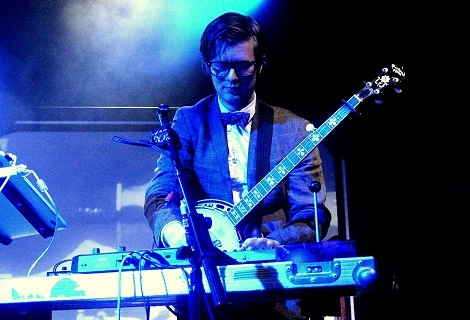 Public Service Broadcasting tuned in to East Village Arts Club, Getintothis’ Joseph Viney found himself informed, educated and entertained. 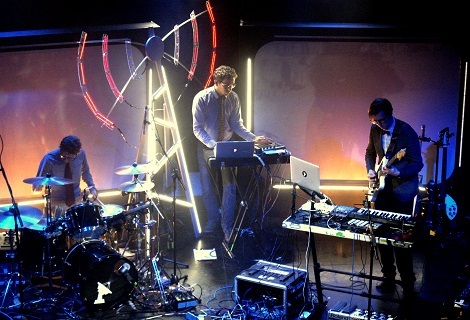 Public Service Broadcasting (PSB) have something of an eerie quality about them. A combination of future technology with social and moral philosophies of the mid-20th century, they come together like the infotainment lovechild of Mitchell and Webb’s ‘Quiz Broadcast’ and the fevered imagination of a Wasteland dweller from the Fallout series. In short, it’s quite apocalyptic stuff if you’re in the right frame of mind. PSB drag the past kicking and screaming into the present day. 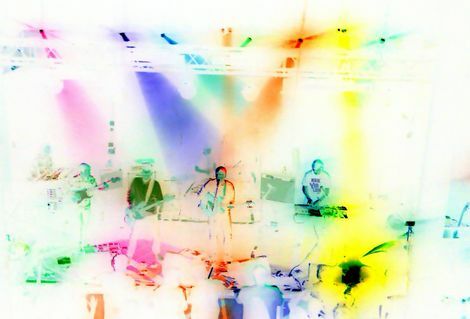 Their songs are comprised of the narration from old, you guessed it, public service broadcasts that are run on top of a fantastic array of instrumentation including organic and electronic drums, keyboards, guitar, bass and banjo. Add a constant visual loop on the screens behind them and you have yourself one helluva audio-visual experience that most bands can’t and don’t want to contemplate. They say canned laughter is the mirth of the dead, repeated forever to indicate to us where humour lies. Consider then that the samples used by PSB are also those of the deceased, warning us about the constant threat of war, consequences of unsecured waste disposal and the dangers of even crossing the road from the dead. Forgive the cliché, but it’s very Orwellian in its design; the faceless-yet-ubiquitous entity ruling us from the ether. But it’s not all doom and gloom thankfully. In fact, PSB have quite the knack of making you forget the underlying themes of their songs. 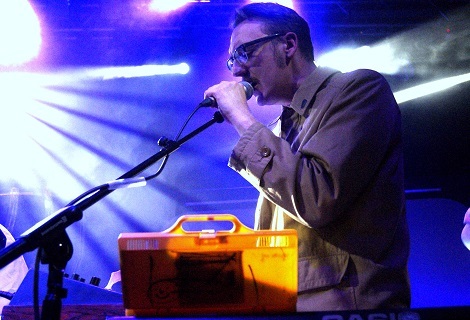 De facto frontman J. Willgoose Esq., looking as if he’s been beamed in from a Dr. Who convention, communicates only through samples elicited from his keyboard. “Hello….thank you…East…Village…Arts Club!” runs a typically endearing one-way conversation from group to audience. The crowd lap it up; it’s fresh and funny. They’re able to back up the humour, presentation and general oddities with a strong set of songs, mainly culled from this year’s debut LP Inform – Educate – Entertain. Songs like Signal 30, Spitfire, Theme From PSB and the really rather uplifting Everest have half of the packed venue dancing, the other half watching with a sense of awe. Even the two new songs given an airing tonight are well-received, packing a punch with gritty riffs and manic drumming, plus an odd adherence to the Dutch language. PSB have the power to inspire a devoted cult of followers, and they will certainly never have you reaching for the dial. Speaking of cults, Lovecraft had the honour of warming up the crowd and did so via the weird charms that their music promotes. Getintothis has seen a few different Lovecraft line-ups in our time, but never has the quality or eagerness of their songs dropped. A certain oddness pervades within their ranks. 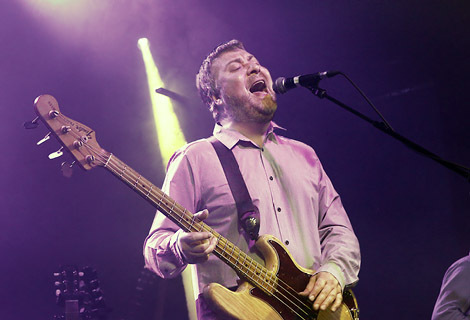 All except leader Craig Sinclair are bedecked smartly in white shirts and black trousers; a uniformity seen in groups like Devo, The Residents and Captain Beefheart’s Magic Band. Very English and pastoral, their tunes hark back to the quiet malevolence of the works of people like Colin Wilson; wherein a creeping sense of dread wraps itself around your nerves and doesn’t relinquish its hold until they finish. By time we get to songs like the glorious Häxan, the crowd are suitably charmed. It’s exactly how they want you to be: unassuming, unaware but always on edge.